Breathe Gently: Out and About. We decided to get out and do some walking today, since we have had a couple of rather lazy weekends over the past few weeks. Jason randomly picked out a London City Walk card, we got our tube tickets ready and off we went. We caught the DLR to Bank station, then the Central line to St Paul's, where we started our journey. 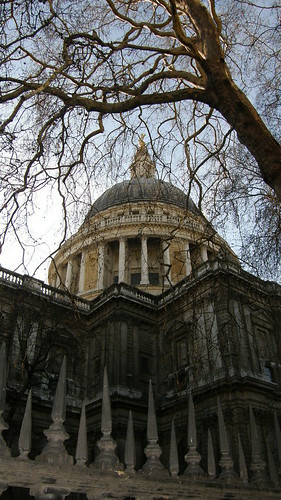 First stop was the magnificent St Paul's Cathedral. I work in Chancery Lane, which is only about ten minutes walk from here, but I've never actually stopped here before. After walking around the perimeter of the cathedral and narrowly avoiding being run over by an ice cream truck, we wandered across the Milennium Bridge and enjoyed the sunshine. Yes, I said sunshine. Did I mention I was walking around in short sleeves outside and wearing my sunglasses today? Been a while since I've done that! 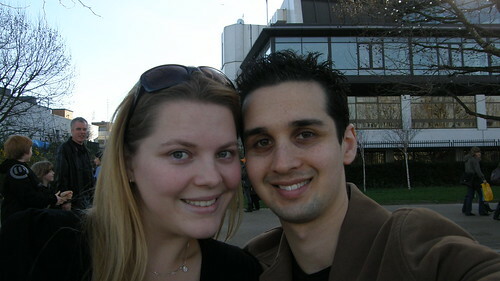 We strolled along the South Bank, passing the Globe Theatre and Tate Modern. There were loads of people out enjoying the good weather. We walked for a good hour or so. 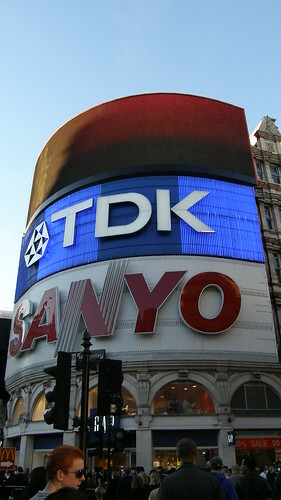 After we got to Waterloo Station, we caught the tube to Leicester Square. 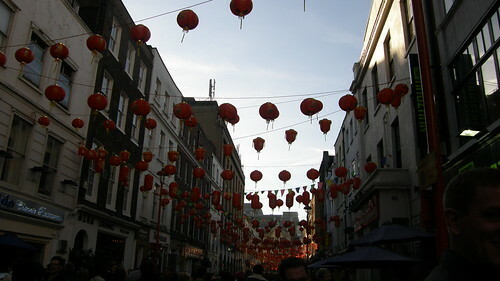 We were meeting some of Jason's workmates for lunch in Chinatown, which was full of people out visiting for Chinese New Year. Gross seafood, yummy pastries. Our goal for the afternoon was to visit Hamley's toy store; five levels of toys! The store was brilliant, if I had spare pounds to burn, I could go absolutely crazy in here. The store was fabulous, though I did wish I could have walked out of there with some goodies. I may not have been able to fit this puppy into my handbag, but he would've looked perfect living here at home on the bed. Anyone feeling the need to buy me presents (cough cough) for any reason, this would be a great place to start! This entry was posted on 09:16 and is filed under Blog 365 , London Still . You can follow any responses to this entry through the RSS 2.0 feed. You can leave a response, or trackback from your own site. That puppy looks so soft! You two are the cutest couple! Sounds like you had a great day, Kudos to you! What a great day! I love days like that. I had a similarly good time today. You guys are ADORABLE. Criminally so. I love living vicariously through your lovely photos. Thanks for sharing! Sounds like a great day! I'm jealous of your sunshine. All we have here lately is cloudy skies and a TON of snow! I love how much fun you seem to be having. Seriously. Insanely jealous. Want to hop on a plane and visit. 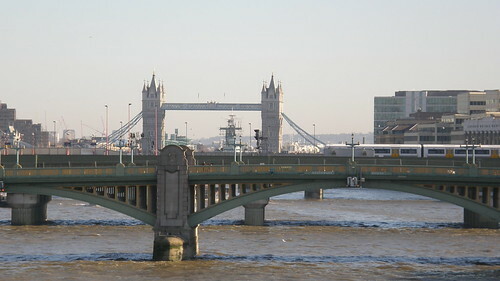 London is one of the best cities in the world to walk in. You lucky duck. Random question, but your hair is super-straight - do you straighten it, or are you naturally blessed like that? Oh these pics are so great! And you two are just adorable together. Even more so than that giant oversized dog! You are so lucky that all that stuff is just a quick tube ride and a walk away. I'm so jealous! Fun! And I'm jealous of your warm weather. Since it is currently -21 here with the wind chill. Funnily enough, I went out yesterday and was so warm I wanted to take my jacket off within about five minutes of leaving my flat - it's been really warm in february in britain the last couple of days! By the way, you have lovely hair! I love your photos! And Hamley's is the best toy store ever. Wow..five levels of toys. Sounds perfect. So much fun. Walking around and exploring a new city is such a pleasure, isn't it? Um, firstly - LOVE your hair! So long and beautiful! Love love love love love it! Secondly, fantastic pics! Loving the fabulous weather! That pic of you and Jason is brilliant! 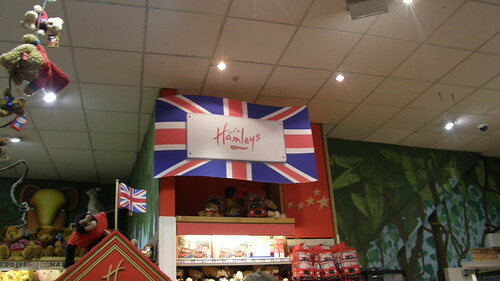 Also - Hamleys?! Best ever! 5 levels of toys - where can it go wrong!! I love the photo with the lanterns. I love the subtle hint about the puppy dog. 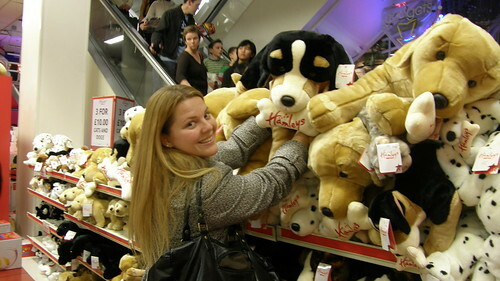 Anytime you're in New York, I'd gladly show you FAO Schwartz, the king of cute stuffed animals!